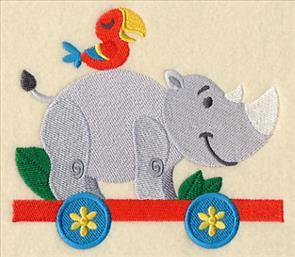 Set off on a stylish safari with creative and colorful new designs! 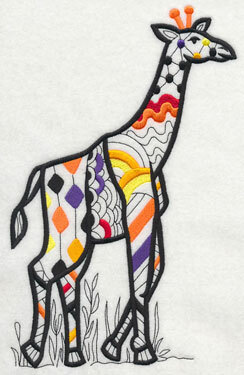 Blackwork animals with pops of color make eye-catching statements on pillows and totes. 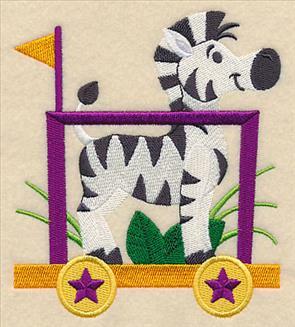 A sweet sew-fari train is ready for a stitching adventure on quilts and bunting. 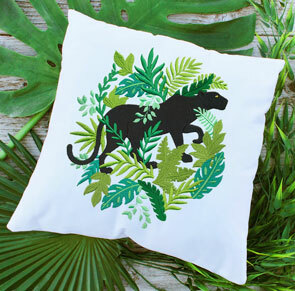 Lush greenery, jungle birds, sleek panthers, and more add a fashionable look towel sets, wall hangings, pillows, totes, and more. 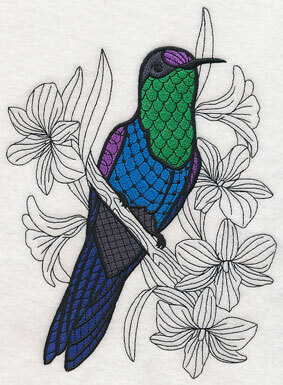 Scroll down the page to see these gorgeous designs! decor with a panther pillow. 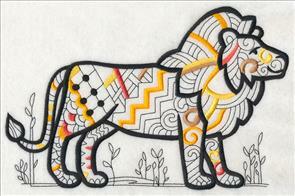 Intricate blackwork detail with pops of bright colors give these safari animals a bold and beautiful style. 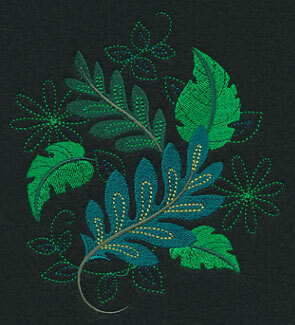 Swirls, zig-zags, and other patterns fill the designs to an a contemporary feel to the embroidery. 9.92" x 6.90" and 8.44" x 5.87" and 7.62" x 5.30" and 6.87" x 4.78" and 3.87" x 2.69"
These blackwork designs feature open spaces between the stitching where the fabric shows through. Stitch on solid-color, low-nap fabrics for best results. 9.95" x 6.89" and 8.47" x 5.87"
7.68" x 5.32" and 6.88" x 4.76"
10.45" x 6.91" and 8.86" x 5.87"
7.81" x 5.17" and 6.86" x 4.54"
A jaguar and zebra are classic safari animals, and are terrific additions to a wide variety of projects. 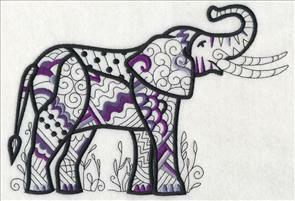 Stitch all of the blackwork designs on a quilt, or add to pillows, kids' gear, and wall hangings. 11.01" x 5.50" and 9.41" x 4.70"
7.81" x 3.90" and 6.84" x 3.42"
9.54" x 6.91" and 8.09" x 5.86"
7.51" x 5.44" and 6.70" x 4.86"
Pick your favorite colors to add to these designs -- you can change them to coordinate with home decor, garments, or to match the natural coloring of the animals. 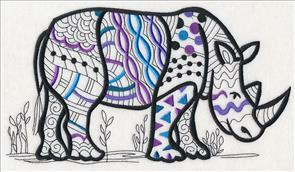 Here a rhino is decked in blues and purples; a crocodile shows bursts of green. 11.01" x 6.09" and 9.41" x 5.20"
7.81" x 4.32" and 6.86" x 3.79"
11.01" x 4.34" and 9.41" x 3.71"
7.81" x 3.08" and 6.87" x 2.71"
Finish off this collection of safari sophisticate animals with a gorgeous giraffe and magnificent monkey designs. 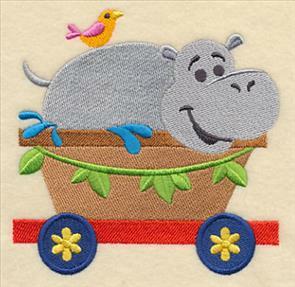 Great on bedding, backpacks, towels, and more! 6.88" x 10.74" and 5.86" x 9.15"
4.99" x 7.79" and 4.38" x 6.83"
11.75" x 6.58" and 9.40" x 5.27"
7.80" x 4.37" and 6.85" x 3.84"
Purchase these colorful safari animal designs individually by clicking the links above, or get all 9 of the designs in a pack. 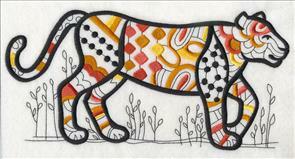 A sleek black panther stalks his prey through the jungle in this collection of bright and sophisticated designs. 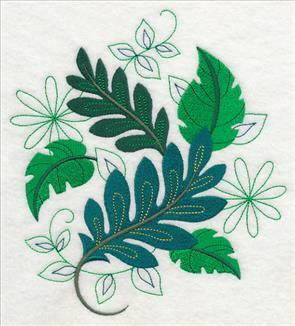 Perfect for updating home decor, including pillows, quilts, and more. 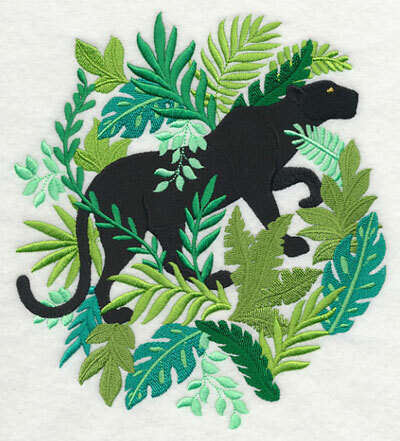 7.01" x 7.80" and 6.20" x 6.90"
5.50" x 6.12" and 4.86" x 5.40"
Stitch this magnificent panther onto your projects for look that's both unique and awe-inspiring. 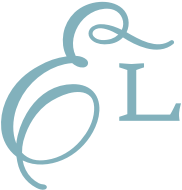 Elegant on framed art pieces, tote bags, towels, and jacket backs! 6.90" x 10.01" and 5.85" x 8.49" and 5.38" x 7.80" and 4.73" x 6.85"
The contrast between the black coloring of the panther and vibrant jungle greenery gives this border a stunning and eye-catching appeal. 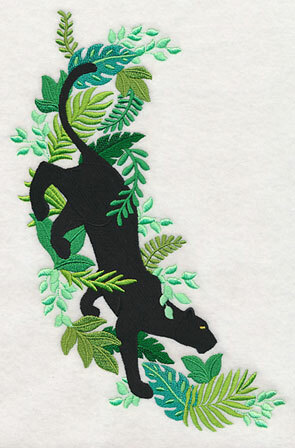 Stitch alongside the other black panther paradise designs on a safari-inspired quilt! 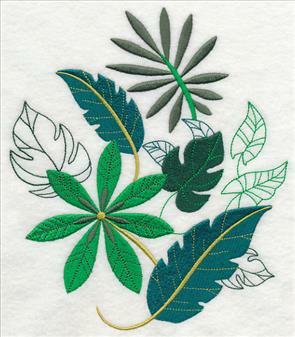 11.75" x 4.40" and 9.40" x 3.52" and 7.80" x 2.92" and 6.85" x 2.57"
Pockets, quilt corners, napkins, and more get an instant update when adorned with these jungle leaf designs. Bring the beauty of the jungle to your home with this vibrant design pack. 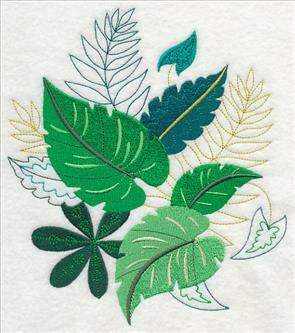 The bright green colors found in this jungle leaf medley pop when stitched on crisp, white fabrics -- and midnight black ones, too. Add to totes, gardening gear, and bathroom linens! 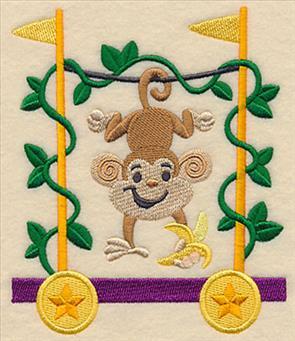 6.89" x 7.54" and 5.83" x 6.39"
4.82" x 5.28" and 3.53" x 3.89"
Create an unexpected look by stitching this design on deep, dark fabric. 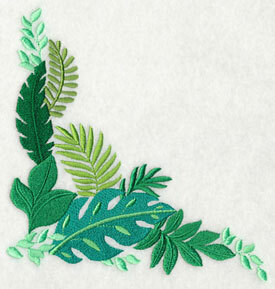 Three different greenery designs showcase the natural beauty of the jungle. 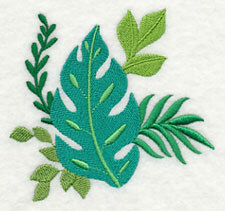 Create a vibrant focal point for home decor by stitching the leaf medleys onto wall hangings, pillow shames, and framed wall art. 6.72" x 7.79" and 5.85" x 6.79"
6.82" x 7.79" and 5.65" x 6.45"
4.82" x 5.51" and 3.38" x 3.86"
Bright and colorful birds pop against light, blackwork flowers and foliage in these impressive designs. 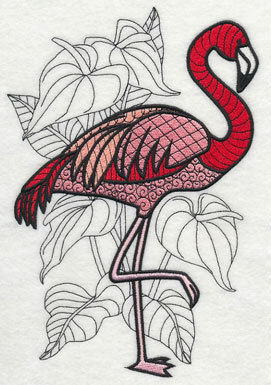 A flamingo stands next to anthurium blooms; impala lilies surround a kingfisher. 6.85" x 10.08" and 5.86" x 8.62"
6.86" x 9.22" and 5.80" x 7.81"
5.39" x 7.26" and 4.85" x 6.53"
A denim shirt gets a tropical update when adorned with one of these blackwork bird designs. 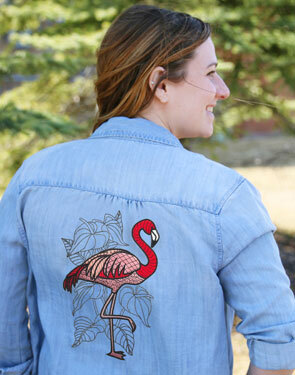 Pick your favorite feathered friend to stitch, then wear your new garment on a warm-weather vacay! 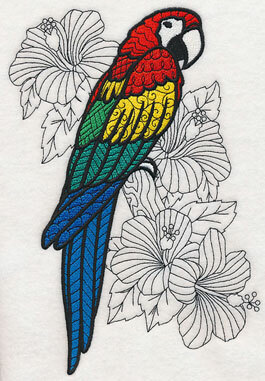 A brilliant long-tailed macaw shows off his colorful plume amongst hibiscus flower on the left. 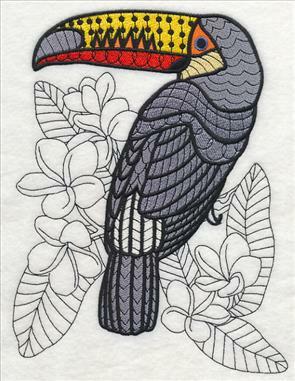 A blackwork toucan with frangipani stands to the right. Terrific on towels, beach bags, and more. 6.85" x 9.90" and 5.85" x 8.46"
6.85" x 8.89" and 6.01" x 7.81"
5.35" x 6.94" and 4.84" x 6.30"
To finish off this collection of blackwork birds, a violet-crowned woodnymph and bird of paradise are shown next to orchids and bird of paradise flowers, respectively. 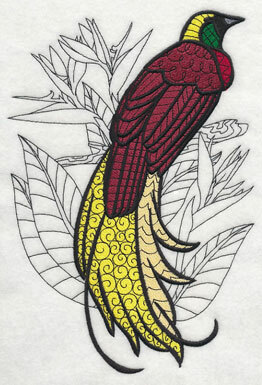 6.88" x 9.38" and 5.85" x 7.94"
6.91" x 10.06" and 5.86" x 8.53"
5.21" x 7.58" and 4.73" x 6.89"
Purchase these tropical bird designs individually by clicking the links above, or get all 6 of the designs in a pack. 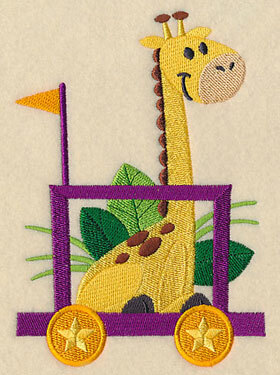 All aboard the Safari Adventure Train! 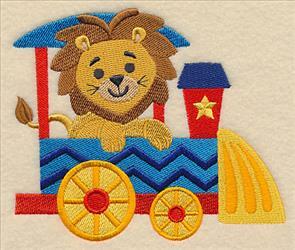 A lion, elephant, and other sweet safari animals catch a ride into town on bright and colorful train cars. 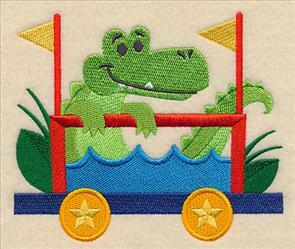 A fun addition to quilts, kids' gear, wall hangings, pillows, and more! 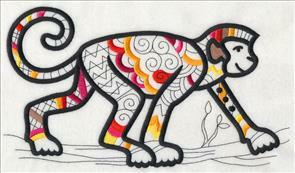 A lion plays at train conductor while an elephant trumpets in exhilaration. 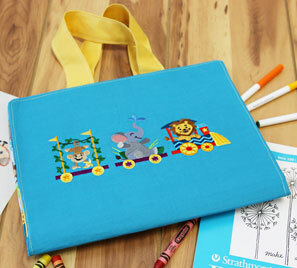 4.83" x 6.64" and 2.81" x 3.86"
We used the above train designs to make a colorful caddy to keep coloring supplies close at hand. The caddy has spaces for markets, crayons, paper, and coloring books. It's a wonderful way to keep organized, and handy for trips to the doctor's office and friend's house, too. 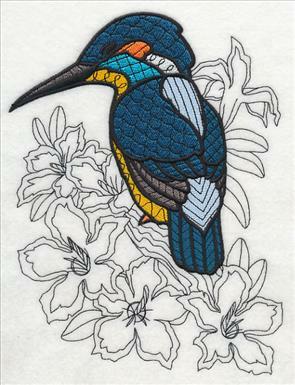 Find the free step-by-step tutorial here. 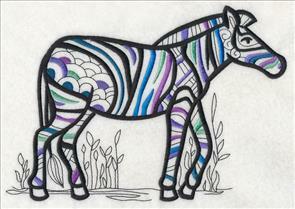 A charming hippo and too-cute zebra stream by on their exciting adventure. 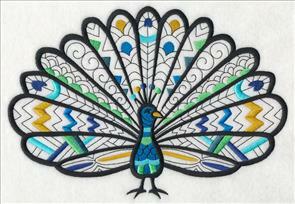 Great for banners, wall hangings, and more! 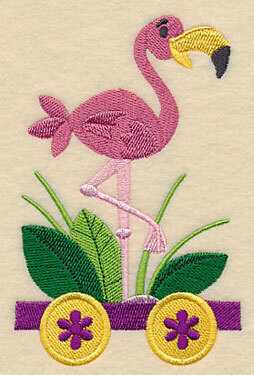 4.84" x 5.53" and 2.81" x 3.22"
A giraffe and a flamingo are the next to roll by on their charming train cars. 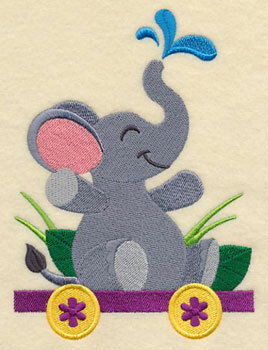 A too-cute addition to any kids' room! 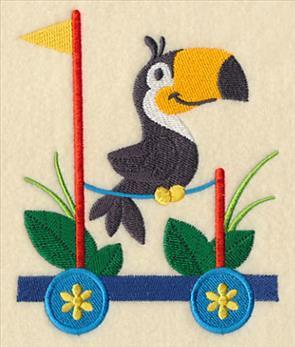 3.48" x 5.38" and 2.03" x 3.13"
A toucan sits on his brightly-hued perch while a monkey enjoys a snack. 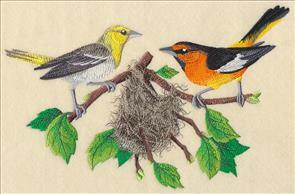 Spruce up decor by stitching onto a wall hanging or framed art. 4.83" x 5.74" and 2.80" x 3.34"
A friendly crocodile watches the scenery stream past; a rhino and his feathered friend spend the trip together. 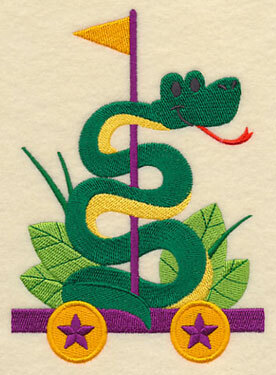 5.41" x 4.84" and 3.14" x 2.82"
A sweet snake slithers up a colorful flag while a tiger takes up the caboose. 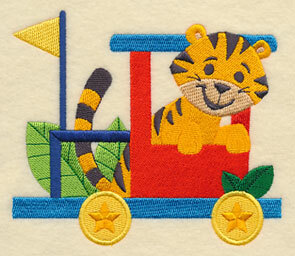 Stitch all the train cars together on a quilt or banner, or pick your favorites for a smaller project! 5.55" x 4.82" and 3.22" x 2.81"
Purchase these colorful Teddy bear designs individually by clicking the links above, or get all 12 of the designs in a pack. Mars wrote in saying "I would very much like to see a Bullock's oriole for those bird-lovers among us on the west side of the Rockies." Thanks for the suggestion, Mars! 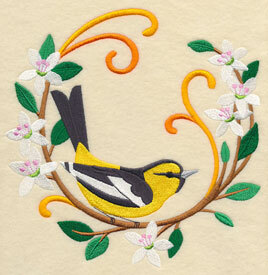 Here a sweet wreath and more realistic design showcase the beautiful birds. 7.77" x 7.81" and 6.89" x 6.93"
5.85" x 5.88" and 4.82" x 4.85"
10.55" x 6.89" and 8.97" x 5.86"
7.80" x 5.10" and 6.85" x 4.48"